Yeah it does, I know it as well as anyone. It doesn’t need to be. It’s only as boring as you make it and we’ll try and keep it interesting. We all lead busy lives these days and not many people have boatloads of free time, I personally try and practice for 20 minutes a day. Some days I do more, but I try and hit a minimum of 20 minutes. It’s not a massive commitment but it’s not a huge amount of time, so it’s really important to get the most of out of those 20 minutes. Chord changes: 5 mins – Work on the chord changes that you haven’t quite nailed down yet. If you’re struggling to get from an F to a G then try and squeeze as many changes between those 2 chords as you can in 60 seconds. You’d be amazed how quickly this will fix those issues. Fingerpicking: 5 mins – This is a great skill to have and the only way to get better is to dedicate some time to it. It’s difficult at first but start with some simple patterns and be persistent. Strumming: 5 mins – Struggling with a particular strumming pattern? Having problems with chucking? Now’s the time to work on your weak strumming areas. Songs: 5 mins (or more) – This is your reward for getting through the past 15 minutes. Everyone wants to play songs which is good and the practice you’re doing will only help this. Songs will combine all of the other skills that you’re working on but will come with the added benefit of giving you something to impress your friends with. So that’s it. Just 20 minutes of your day and you’ll see vast improvements – improvements that you won’t see by just battling your way through songs every day. Hopefully it will work as well for you as it does for me! 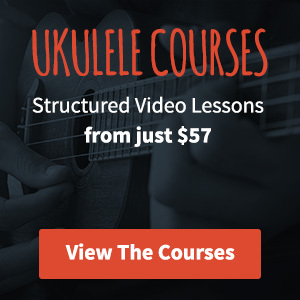 For those of you that are feeling like you’ve progressed beyond this, take a look at my printable ukulele practice routine!